we will revisit some of the general differences between rifles chambered in 7x57 and 7.62x51mm NATO. 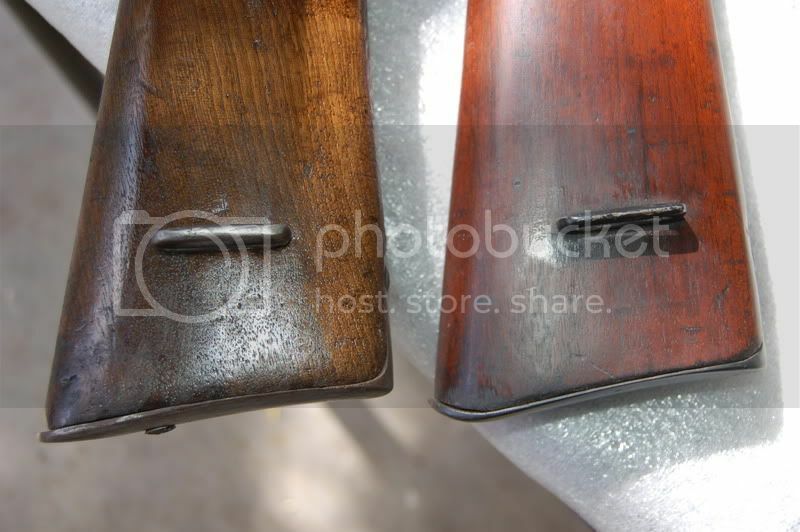 The buttstock for the 7.62 rifle (top) will typically have the addition of a crossbolt for added strength. In addition, the trigger guard will be modified to a lock screw configuration. While both will have the side mounted sling (solid metal pinned version shown), the 7.62 rifle (right) will have the buttplate bottom cupped. Some rifles may have a cutout with screwed in sling swivel. With the handguard removed, it is easy to see indications of the conversion to 7.62x51. Other than re-boring, the shortening of the chamber by 6mm is obvious due to the setback at the receiver (bottom). Naturally, this precludes the hanguards between the two rifles being directly interchangeable. 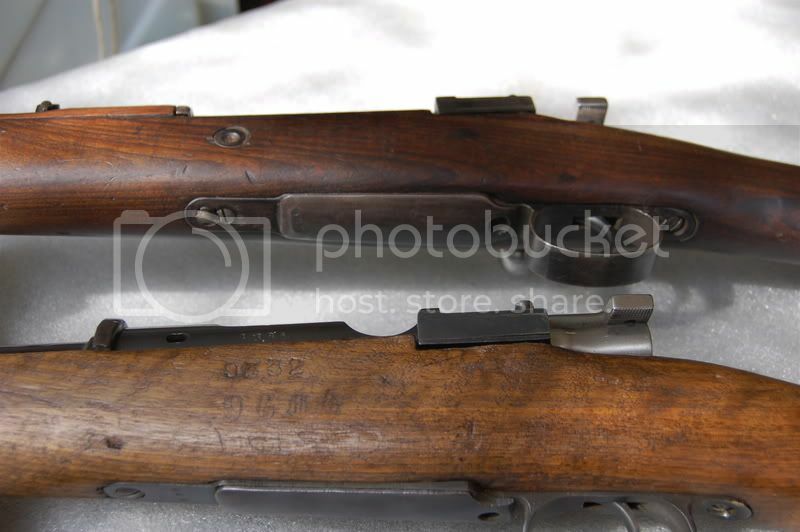 You will also note that, due to the change in ballistics, the rear sight has had the original "3" overstruck with a "2". Depending on the end user, the rifle may have the Guardia Civil "Falangist" crest added. You may also have an un-crested NATO conversion easily identified by the "OT" (Organización del Tratado del Atlántico Norte). You got me looking at my 1916 rifle. Mine is stamped with the caliber of 7.52, but has the cross bolt. Sight #3 position still unmarked in anyway. Took off the hand guard and the barrel is set back. 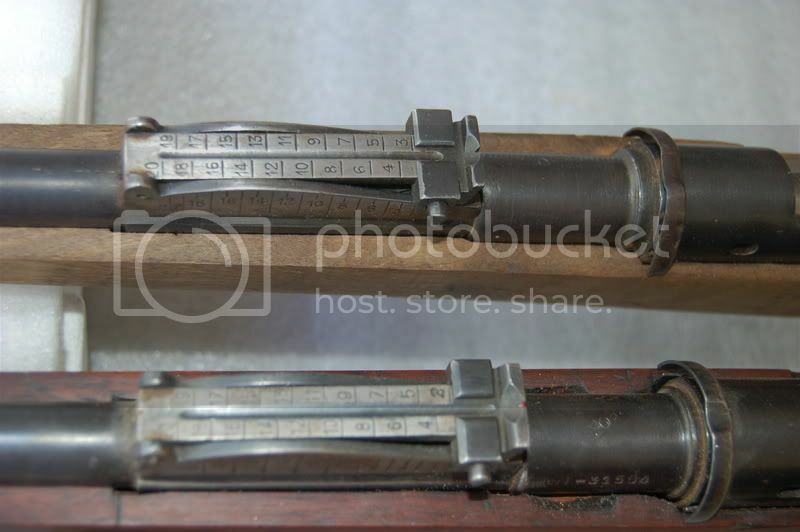 Any idea about the caliber stamp??? That is odd. 7.52mm is a bore of .296 inches. Someone picked up the "5" stamp instead of the "6"? Have you shot it? Chamber cast? Does it have an "OT" prefix on the serial number? It has a Z prefix on the assy number, serial has no prefix. I did put a ball gauge in the barrel, came out around .302, which excludes the rifling depth. A 308 brass fit perfectly and extracted, so I guess it's a fluke with the caliber stamp. I also have a "Z" prefix, but it is marked 7.62. Don't rely solely on the OT serial number. My 1916 has an OT serial number and is in 7x57. But it does still have an Oveido crest. Actually it has an RF serial number so the OT is probably correct. It does have the curve at the bottom of the buttplate though. Now, that is very odd. Almost as if they marked it but forgot to do the conversion. The rear sight been modified with the "2"? The rear sight is different from the 2 known types. It starts at 1 and has not been renumbered in any way. If I remember correctly the RF number has something to do with the differences from 7mm and 7.62 1916 carbines. When I have more time, I'll have to do the research again to come up with what I found out years ago. Nice civil guard crest on the one above. I looked for a time but couldn't find one in 7mm. Were all the civil guard ones converted to 7.62? To my knowledge, all the CG crested rifles are in 7.62. Picture of your sight would be interesting to see. The only overall shot of the rifle in my files! You can see the numbers stamped on the right side of the receiver, meaning unknown to me! If you open in a new tab and zoom in, you can just make out the CAL 762 stamp, the serial number and ghosting of the previous SN between them!